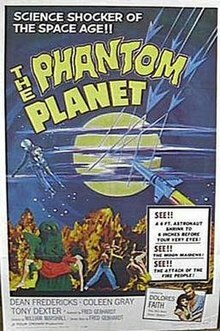 The Phantom Planet is a 1961 independently made American black-and-white science fiction film, produced by Fred Gebhardt, directed by William Marshall, that stars Dean Fredericks, Coleen Gray, Anthony Dexter and Francis X. Bushman. The film was released by American International Pictures on a double bill with Assignment Outer Space.In 1980 the United States Air Force's Space Exploration Wing has bases on the Moon and is on the eve of a mission to Mars. When another of their two-member crew Pegasus spacecraft mysteriously disappears, rumors begin circulating of "space monsters" and "phantom planets". Mars mission pilot Captain Frank Chapman and his navigator Lt. Ray Makonnen are ordered to investigate.During the search, their spaceship suffers damage from a meteor shower, requiring that both men go outside to make repairs. A bullet-sized particle, however, pierces the air hose on Chapman's space suit, rendering him unconscious. Makonnen is able to repair the hose, but as he opens the airlock hatch, he is fatally struck by a similar particle. Makonnen's last act before being propelled away into deep space is to push Chapman inside and close the airlock hatch. Chapman comes to and finds Makonnen gone and himself unable to communicate with the lunar base. He records a log entry about the preceding events, noting that he must now make a forced landing on an asteroid, that it is somehow pulling in his Pegasus spaceship.